Looking for different present ideas this Christmas? Give the gift of travel with hirebike. From the 22nd November 2017, you can use the PROMOCODE HBXMAS and get 25% off joining fees. Pick up an electric bike membership for £30 and a pedal bike membership for just £15. Christmas shopping made easy! HALF PRICE Annual Memberships to kick off the Autumn! Use PROMO CODE: HBHALF to pick up pedal or electric memberships at half price! That’s £10 for a pedal bike annual membership and £20 for an electric bike membership. Remember, there’s half an hour free with every pedal journey and 20 minutes with every electric bikes journey for annual members. Not quite ready for an annual membership? No problem! Try us out first with 2 free trips! Use PROMO CODE HB2FREETRIPS and try a pedal or electric bike out. Please note: You will be required to set up an account in order to benefit from the discounts. A minimum credit of £2 is required to activate the promo codes. Our ‘two free trips offer’ promo code will give the user £6 credit, based on hire fees being £3/hour for electric and £2/hour for pedal bikes. Use our promocode when you sign up to an e-bike membership with a minimum payment of just £2, and we will give you £10 worth of credit! Yes, it's true! You could be one of the first people of Lincoln to try one of our e-bikes for yourself ahead of our launch in a few weeks, and see how we're making it even e-easier to zip around town and beat the traffic. We will also have our popular pedal bikes available too to try. Alex Woodyard or another famous footballer? Historical figure? Your favourite teacher? Who will it be? We are running a competition in conjunction with Lincoln Castle to name 3 e-bikes plus a chance to pick up a few extra prizes along the way! – An annual electric bike membership. 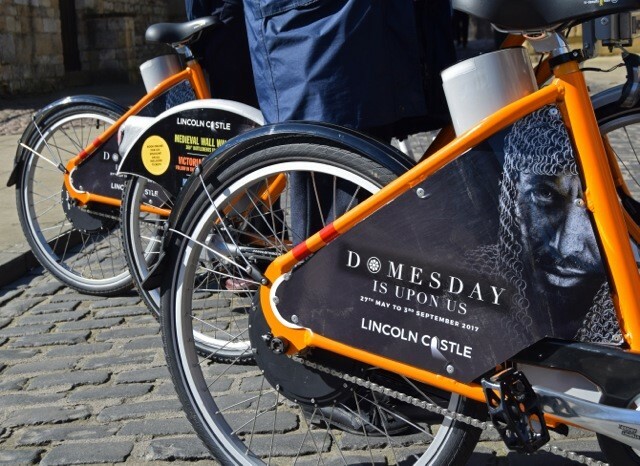 – A family ticket to Lincoln Castle to see the Domesday exhibition. – A family ticket to The Collection Museum to see the Battles and Dynasties exhibition. Previous names have included Nippy, Isaac Newton, Sarah Swift and George Boole. Which name will you choose? Simply comment on the post on Facebooke with your suggested name and why or email jo.kyne@hourbike.com. You need to enter by the end of July and our 3 winners will be announced in August. GOOD LUCK! Please click on the link below for a downloadable leaflet on Park and Bike in Lincoln. Will you be the 2000th Member? We are getting close to signing up our 2,000th member. To celebrate the occasion, we will be giving away a goodie bag to the lucky person. Please follow us on Facebook and Twitter where we will announce the winner.